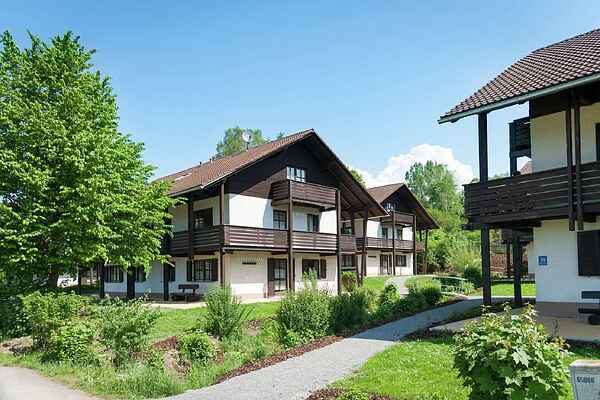 The houses, constructed in the solid Bavarian country style, each provide enough space for six apartments. The entire property is located on a plot measuring around 1 ha. Open your front door and you will almost literally be in the largest nature reserve in central Europe; the Bavarian Forest. The 4-5 person homes (DE-94556-10) are located on the ground floor. This gives you access to a terrace. A 4-5 person home can also be found on the first floor (DE-94556-11). You will have a spacious balcony at your disposal here. The 2-4 homes on the second floor (DE-94556-12) are just as large as the 4-5 person homes in terms of living space. You will also have a balcony at your disposal here. All homes have been furnished with care and feature a bathroom with shower. For the 4-5 person homes, you will have two bedrooms at your disposal, while a single sofa bed can be found in the kitchen. The 2-4-person homes with slanted roof feature one bedroom. A 2-double sofa bed can be found in the kitchen. All homes feature a flat screen TV and WiFi.